If there was a high level, international scale bribery case in Australia you would think it would be in the public interest. 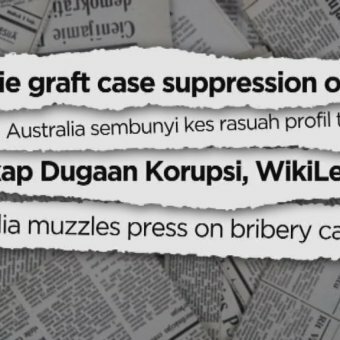 WikiLeaks has published a apparent gag order that would prevent Australia media and others from reporting on the case. The closet I can find to an actual media report would be ABC's Radio National article on the release and the ABC's reporter's frustrations at having to censor large portions of the details. It's even questionable if Australian's can link to WikiLeak's release, making for some very chilling effects indeed. It's amazing how weird it is to read that SMH article as it tries to say what it can about the release without being allowed to say what's actually in the release.